Sinh is an ancient dragon who sleeps in the lowermost depths of Shulva. Long ago the Sunken King erected a grand city and an Eternal Sanctum in which to shelter and worship the magnificence of Sinh. The Sanctum appeared to be a solemn temple, but it was filled with devilish creatures that ensure no trespasser could cause offense. The Sunken King established an order of priestesses who sang to preserve the dragon’s deep slumber and the great dragon continued to sleep soundly. That was until honorable Sir Yorgh, leader of the Drakeblood Knights invaded Shulva and set siege to the Eternal Sanctum seeking the blood of the eternal dragon. 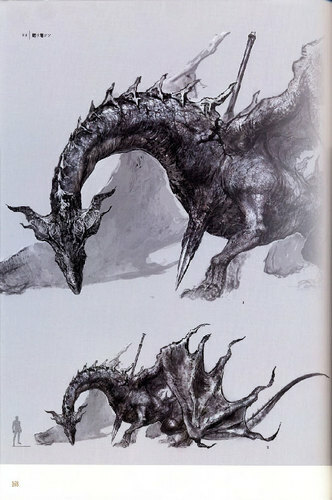 The black armored Drakeblood Knights, who came from a land long forgotten, believed that fresh dragon blood was sacrosanct and that by obtaining it they could achieve a true understanding of life, transcending their own banal existence. These knights worshiped the blood of dragons and wore red cloth wrapped around their black armor representing the sacred blood of dragons, as well as wielding greatswords with insignia chiseled upon the hilt symbolizing dragon’s blood. In response to this invasion, the Sunken King’s sanctum knights renounced their own flesh so that they may eternally guard the Sanctum from Sir Yorgh and his Drakeblood Knights, but their efforts were in vain. While Sinh slumbered on, Sir Yorgh disturbed its rest with a single great strike of his spear. With a flash of steel Sir Yorgh’s spear pierced the dragon’s belly and drew the blood he had coveted. But Sinh was not killed, instead, unable to bear it any longer, Sinh spewed forth the poison that had long brewed within him, blanketing the city in a miasmic cloud of death. Sir Yorgh disappeared into the Eternal Sanctum, the Sunken King, defeated by Sir Yorgh, drowned in the poison and the Drakeblood Knights sunk into the Sanctum along with them. The rain of death toppled the city, and shortly after the dragon’s awakening, the towering bulwark, the Eternal Sanctum, crumbled. The knights and soldiers of the Sunken King were asphyxiated by the poison that emitted, their weapons and armor becoming corrupted and corroded by the poison. Even the line of priestesses did not escape the miasma, and their tiaras were warped by poison, perhaps transfiguring them into the monsters we encounter. 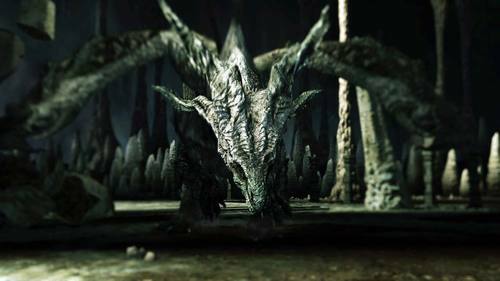 With the poison exhumed, the dragon’s purity was restored. Sir Yorgh’s spear still jutted out of Sinh’s belly, but the dragon decided to return to its rest. As the Player approaches the city, Sinh is disturbed once more from his slumber and returns to his sanctum, where he awaits his next challenger. Sinh was poisoned by Nito. 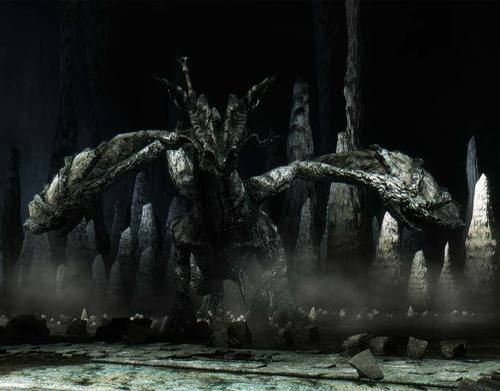 In the introduction to Dark Souls, Nito is shown releasing a "miasma of death and disease" on the Dragons. It is possible that Sinh was affected by this miasma and began hibernating underground. Shulva has a strong theme of death, with the area known as the "cave of the dead" and the numerous tombs and coffins in the Sanctum, which could be a thematic connection to Nito. In addition, the Rotten, who bears Nito's Soul, is fought just before entering Shulva.